The calm waters are perfect for swimming and safe for the little ones. Sink into the cushions after a fun day at the beach. Whip out your family's favorite recipes and save on dining out. Ala Wai Golf Course is a five minute drive. The high-rise of The Residences at Waikiki Beach Tower kisses the ocean, and the protected waters of Kuhio Beach are right across the street. When you arrive at the resort, make a pit stop at your condo to get changed into swimsuits – don’t bother unpacking, there's time for that later – spray everyone head-to-toe in sunblock and head to the rooftop pool. Go for a swim or grab a lounge chair and get comfortable; I have a feeling that you’re going to be here for a while. Up for a fun family cookout? When it’s lunchtime, take advantage of the bbq grills. Let the little ones help carry burgers, hot dogs and sides. After lunch, get in a workout at the well-equipped fitness center. A post-cardio stop at the sauna is a must. One-bedroom condos sleep four guests and are on the lower floors of the resort. Two-bedroom condos sleep six guests. Partial Ocean View and Deluxe Oceanfront are located on the lower floors while Premium Oceanfront condos are located on the upper floors. All condos are individually decorated. Full kitchens have what you need to whip up anything from quick snacks to Thanksgiving dinner. Visit the Safeway to stock up on ingredients for your famous sugar cookies and when you return to your condo let the kids assist with baking a batch (or two!). Don’t worry if there’s a sugar explosion and it ends up all over the little ones; that’s what the in-suite washer/dryer is for. Throw in a load of laundry while the kids challenge each other to a game or watch a movie on the PlayStation 3. Bring favorite games and movies from home or browse the selection available to rent at the resort. 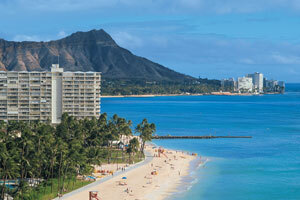 Surprise the kids with visits to the Waikiki Aquarium and Honolulu Zoo. The Waikiki Aquarium was founded in 1909 and is a second oldest public aquarium in the United States. Check out the Hawaiian monk seals, angelfish, butterflyfish, damselfish, crabs, lobster and sea cucumber. The forty-two acre Honolulu Zoo is located in the heart of Waikiki and is home to several animals. There are various frog and toad species, the Japanese Giant Salamander and the Koloa Maoli (also known as Hawaiian duck.) The Honolulu Zoo also features several endangered species such as the Palm Cockatoo, Laysan Teal Asian elephant and the Galapagos Tortoise. Calling all golfers! The eighteen-hole Ala Wai Golf Course is just a short drive from The Residences at Waikiki Beach Tower and offers golf for all skill levels. Stop by the on-site Pro Shop for merchandise or equipment rentals.